If Buying MLM Leads Is Crazy Then I’m Going Insane – And So Should You! The idea of buying MLM leads is often met with skepticism but nothing could make more sense. 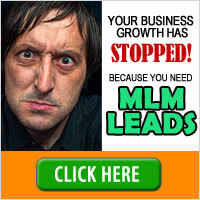 The job of an MLM Leads Company is to find leads that are looking for a home based business opportunity. They use extensive surveys to qualify the wants and needs of their work at home leads so they can determine how serious they are about enrolling in home based business. Getting a list of quality MLM leads as fast as possible is crucial to anyone starting as a MLM Distributor. While other methods can take months to get you your first lead a MLM Leads Company can deliver an order of prequalified leads within 24 hours. This lets you get started on making your business successful right away. Do you know enough about your home business opportunity to answer the questions your leads will ask you? This is not to say that you need to know everything about your business. Most of the time you merely need to read over the information that has been provided to you by your MLM Upline. I would suggest that you read all of your business information at least once before making contact with your leads because if they are interested in your opportunity they will likely have questions for you. Do you have the time to dedicate to contacting your leads? While this may seem like a no brainer you might be surprised. Many people sign up for an MLM opportunity and then don’t make the time to properly run their business. If you are not dedicated to succeeding in your company then now is not the time to buying mlm leads, even if that investment may be the best thing you could do for your home based business. Can you afford to be buying mlm leads? In your excitement to get your home based business off the ground you may think things like ‘If I buy my leads now I’ll be rich in days! I can put off paying that bill until I’m rolling in the money….’ While it is true that quality leads provide a large amount of contacts interested in a home business opportunity, it is still unwise to be buying MLM leads that you can’t afford. Quality MLM Lead and Home Business Lead Companies are able to generate thousands of leads per month and they will be able to provide you quality leads when you have the money to invest. Don’t go hungry today for the hope of tomorrow. Most MLM’s provide a starter package for you if you are new to the business, and you are likely to find the answers to any questions you may be asked in there. Read all of the material that you have been given in your starter kit, and any additional information your Upline is able to give you about your MLM Company. Then schedule some time to dedicate to contacting your recently purchased MLM leads. All of these preparations come across when you contact your work at home leads because you will be more relaxed, knowledgeable, and confident in your home based business opportunity. Your excitement and confidence will infect them to be excited with you. Without being prepared your MLM leads will feel that you are only there to take their money and fear that you will not be a supportive upline when they need you most.